Some sources (Gcc, Pure C, and Profimat). More informations about the FIREBEE on the ACP site. 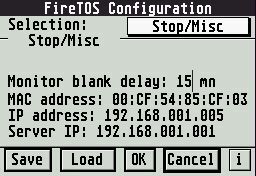 The FIREBEE's configuration is set with a CPX, used normally with XCONTROL, ZCONTROL, or COPS. Configure the Non Volatile Memory. Configure the boot in Flash Eprom. See the load of the system (MiNT or MagiC only). Measure the Firebee temperature (need and Eiffel card card inside the same box). Blank the monitor after a delay. Save : Button for save adjustments on the disk. Load : Button for load adjustments saved on the disk. OK : Button for validate the values changed into the non volatile ram. Cancel : Button for not change values to the configuration. i : Button for display informations (authors and SDRAM). Under TOS create a desk-accessory CT60TEMP.ACC and ask to reboot. Under MiNT create the program CT60TEMP.APP and start this program. Under MagiC start a thread. The current value of CPU average load. The level of CPU average load. The curve of CPU average load during the last hour. Without MiNT 1.11 or more, this curve is very approximate. At this page you can see the Firebee's temperature during the last hour if you have an Eiffel card (with the cookie 'Temp'). This curve is normally in blue and change to magenta if the fan works (set to on by the Eiffel card). 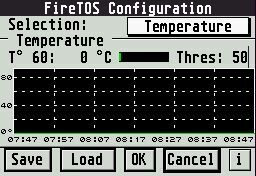 The green curve, the 68060 temperature value, and the trigger level are not used because there are no sensor on the Coldfire (it's a 68060 feature). The total capacity of the ST-Ram. The total capacity of the Fast-Ram. The number of free bytes for the ST-Ram. 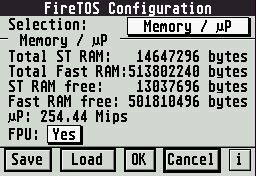 The number of free bytes for the Fast-Ram. The number of millions instructions by second worked out by the microprocessor (BogoMips). Select the boot order on the IDE and SCSI drives (8 choices). Select at boot the operating system by default. Select at boot the SCSI arbitration. 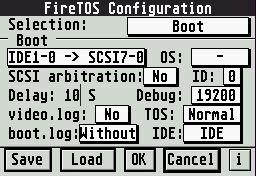 Select at boot the SCSI identificator (0 to 7). Set the delay at boot in seconds (used for timeout with the boot menu). item Set the default speed of the highspeed serial port used also for debug. Under TOS, remove the caches during 5 seconds when a program is started or remove the copyback alert box. Redirect displays of the AUTO folder's programs to a file boot.log. Get a debug file video.log. Swap the two IDE ports (CompactFlash and IDE). Set a delay for blank monitor (disabled if set to 0). Set 3 last bytes of MAC address, begin is 00:CF:54. Set host IP address (for TFTP). 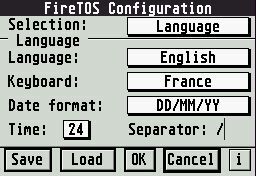 Select at boot the language by default. Select at boot the keyboard type. Select at boot the date format. Select at boot the time format 12 or 24 hours. Select at boot the date separator. Select at boot the screen resolution, if the prefered video mode is found on the monitor, the mode added to the list. Select at boot the numbers of colors (256/65K/16M). 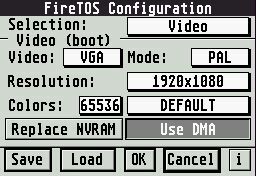 Select using DMA for boost display (this feature is used only for the Radeon board, because the Flexbus has troubles sometimes with ACP video). Replace the NVRAM reading by TOS values saved in the Flash and use the IKBD clock instead of the RTC. The main task of this program is to put TOS binary (.BIN or .HEX) files inside the flash.